Watch your favourite video songs and movies in video player. It supports AVI, H.264, H.263, MP4, 3GP file types. Listen to your favourite songs in music player. It supports MIDI, WAV, MP3, FLAC etc. file types. It is running satisfactory but neither flip cover nor scratch gaurd is available online or offline. really bad. 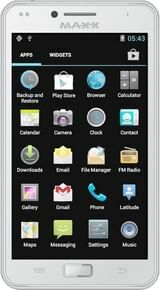 a good smartphone packed with basic features with unbelivable price..!! hello guys, recently i bought MAXX AX8 RACE on 11 th of feb. i got it for only Rs 4299. on infibeam.com. first i was surprised that the features are really superb with this price. but as we talk on camera, the camera quality is not so good as compared to 8 MP camera. i think it gives less than 5 MP camera quality. but that is not the issue. and most imp, we can get 2 GB internal memory. i was really surprised. so, guys, if you have small budget, to buy android smartphone then closed your eyes, and buy this smartphone. even temple run oz is running too, but little bit slow. camera is not upto mark. camera is less than 8 MP. lock button is on upper side. that's really disgusting. and most important, flip cover and scratch guard is not available in the market, not on online and not on offline, i am using Samsung Galaxy Grand's scratch guard.